Canon releases an update to one of the most useful prime lenses for DSLR photographers: the 35mm f/1.4. The optic features Blue Spectrum Refractive Optics with a fast maximum aperture for shooting in low-light situations and controlling depth of field. Full time manual focus override, two aspherical elements, and one Ultra Low Dispersion element highlight this well-specified optic. 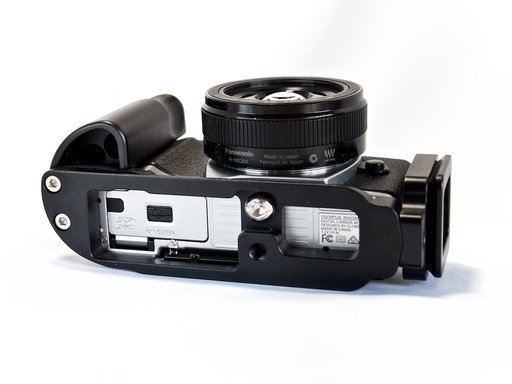 Works with both full frame and APS-C bodies. Featuring the L-series designation, this lens is also dust and moisture-resistant. A nine-blade aperture provides smooth out-of-focus areas in selective focus images. 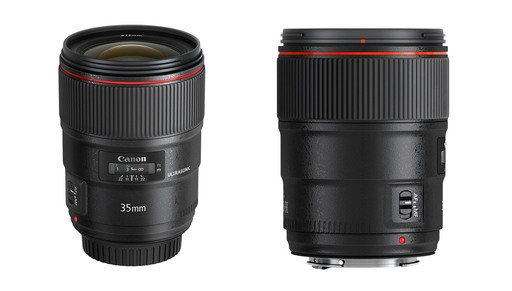 The Canon EF 35mm f/1.4L II USM lens can be preordered for $1,799. 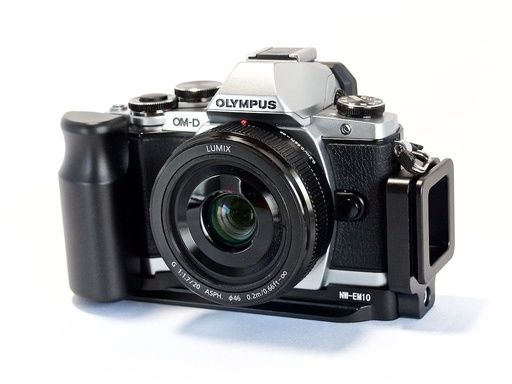 How is the New Olympus E-M10 Mark II Better? 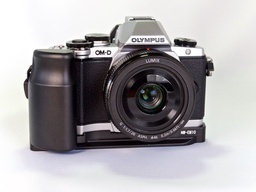 Olympus has packed a lot of technology into its smallest OM-D. But what's improved over its award-winning predecessor? Let's take a look. This Micro Four Thirds camera looks like a great value at $649. You can hear more about this robust entry into the mirrorless market by listening to this week's TDS podcast. My assistant Leah had been hired to photograph one of those challenging midday backyard weddings. She was very nervous about the contrasty lighting. I told her, "Worry not." We'll get you fixed up with a flash rig that I've used since the film days, and it's still amazing today. I use a Stroboframe Quick Flip 350 Flash Bracket ($20), with a Nissin Digital i40 Speedlite Flash ($269), and a Canon OC-E3 Off Camera Shoe Cord 3 ($69) - although you can get third party versions for as little as $19. Here are the basic components shown as individual pieces. 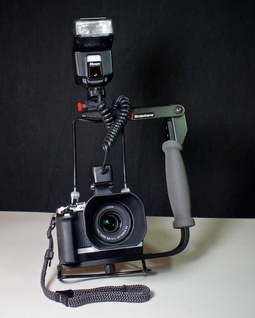 The Quick Flip bracket works for both horizontal and vertical shots. When you turn the camera to portrait position, just "flip" the bracket arm. The flash is always positioned over the lens. I set the flash to TTL, dial down Flash Exposure Compensation 2/3rds of a stop or so, and connect all the parts. I told Leah to use the flash outside and in. In the backyard it helped tame nasty shadows. Inside, it helped illuminate the happy couple. And because the flash is away from the lens on a bracket, she never had to worry about red eye or unsightly shadows cast on the wall. Here's a before and after comparison. 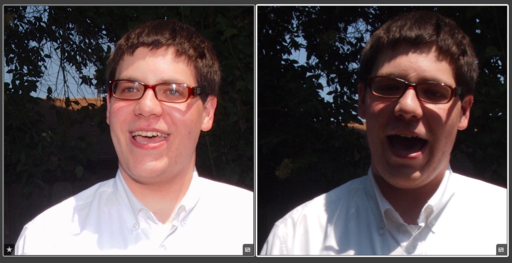 The image on the left is with fill flash, and on the right, without. Quite a difference! 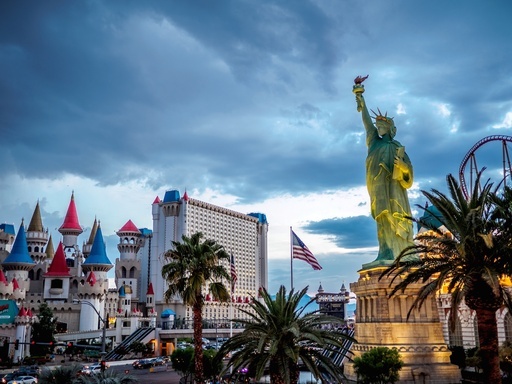 Regardless of the type of cameras we have, photography is photography. And taming contrasty light is essential for weddings and events. You can see this technique, and more, in action by watching my Fill Flash Portraits title on lynda.com. I need lighting for product shots, macro work, video interviews, and gosh-knows-what when I'm on the go. But my camera bag has only inches of space to spare. So I've devised a kit using the Ikan iLED-MS Micro Spot On-Camera Light, a film can diffuser, and a Joby GorillaPod Tripod. The entire kit weighs less than 7 ounces, yet provides powerful, flexible, diffused lighting. 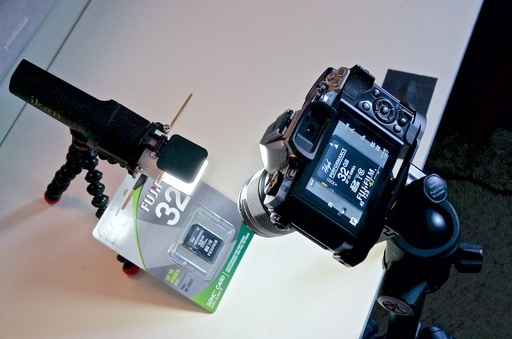 The Ikan LED light with DIY film can diffuser and Joby Tripod. Photos by Derrick Story. 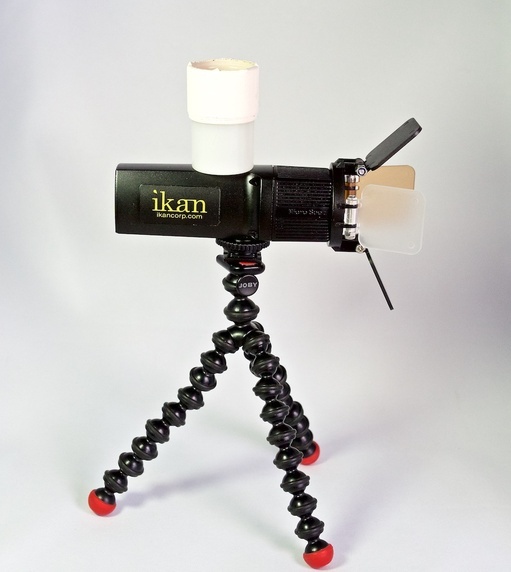 The Ikan light by itself is a nifty unit. It's a lightweight, cool-to-the touch, daylight-balanced, LED about the size of a small flashlight (5" long). The front of the light incorporates a lens system that creates a 30 Degree beam angle providing a directional light well suited for on-camera use or also as a kicker light. The unit features a discrete on/off switch and is dimmable from 100 to 10 percent on using an integrated thumb wheel on the side. It also includes a built-in diffuser panel, CTO filter for balancing with ambient indoor lighting, and a set of barn doors. Everything folds up neatly. You can recharge it via any USB charger you already have in your bag. I was impressed with the built-in diffuser panel that simply flips over the LED bulb. But there were instances when I wanted even a softer light. So I retrofitted a FujiFilm 35mm canister to create a gentle light for macro and product photography. FujiFilm 35mm canister with white gaffer's tape for a snug fit. The film can mounted pretty well in the LED light, but it was just a tad loose. So I wrapped a few strips of white gaffer's tape to create a snug fit. The modified light with the film can diffuser works great for close up work. And since I can adjust the output from 10-100 percent, I can get just the look I want. The entire kit weighs just ounces and fits nearly anywhere in my camera bag. In fact, it's so nimble, I may set up a second kit so I can use two-light schemes. The Ikan iLED-MS Micro Spot On-Camera Light kit has a high Nimbleosity Rating. What does that mean? You can learn about Nimbleosity and more by visiting TheNimblePhotographer.com. 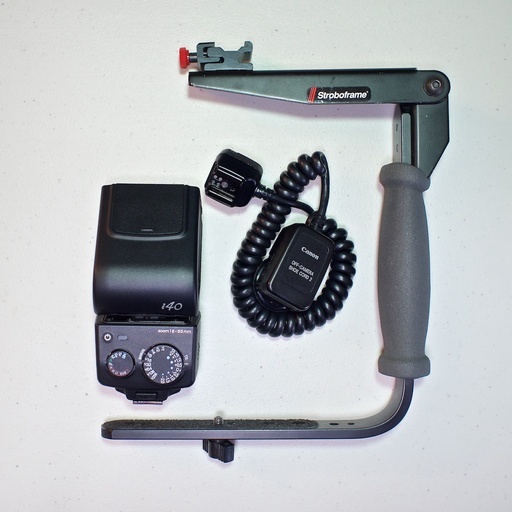 At the last TDS Photography Workshop I was introduced to the Neewer Black Metal Quick Release L-Plate Bracket Grip ($28) by one of the participants, Kevin Miller. 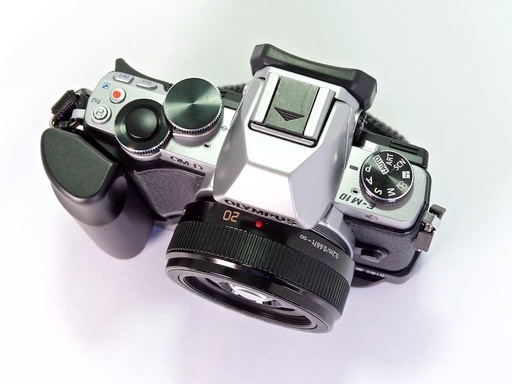 He was sporting one on his black E-M10. The integrated Arca-Swiss mounting plate that comprised the bottom and side of the grip was just what I was looking for. I have a similar rig for my E-M5 Mark II, but unlike that accessory that cost me $149, the Neewer is only $28. And it's terrific. Neewer grip with side plate attached. 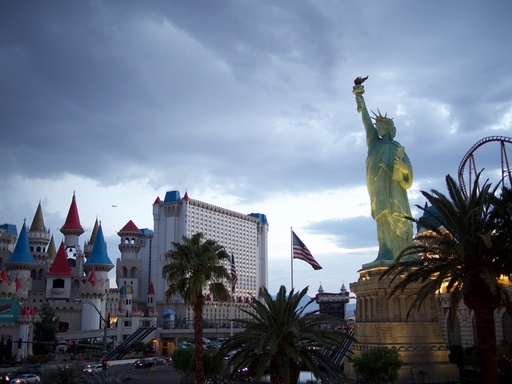 Photos by Derrick Story. The side plate is removable, so if you don't need a quick release for the vertical position, you can unscrew it, as I normally do. 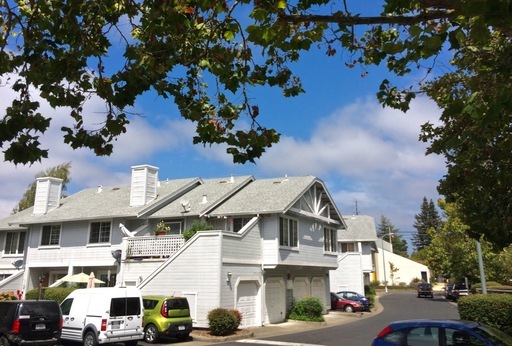 (See top photo for without, and above image for with.) Regardless of what you do on the left side, the right side grip is very comfortable, especially for larger hands that like a little extra real estate to hold on to. Smaller hands, however, might not like having to reach back a bit with the index finger to press the shutter button. You'll have to try it to determine for yourself. The bottom features an opening that allows you to change battery and memory card with the grip attached. 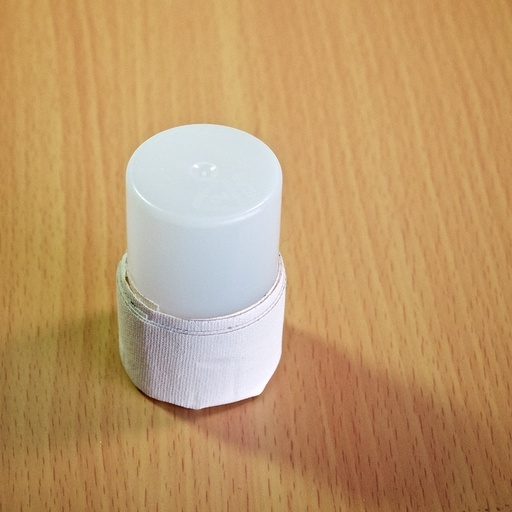 There's also a tripod socket for those situations when you're not using Arca-Swiss. And a nice touch is the mounting screw that accepts both an allen wrench (included) or a slot for coin tightening. So if you misplace your allen wrench, then you can still attach and remove the accessory. The grip's design works well with the E-M10. And the aluminum material is light and durable. And to tell you the truth, after having the grip on and shooting with it, the camera feels a bit awkward without it. The Neewer Black Metal Quick Release L-Plate Bracket Grip has a high Nimbleosity Rating. What does that mean? You can learn about Nimbleosity and more by visiting TheNimblePhotographer.com.